A man who lost his farm in an unsound treaty claim, had his trust busted, and was jailed in a miscarriage of justice. 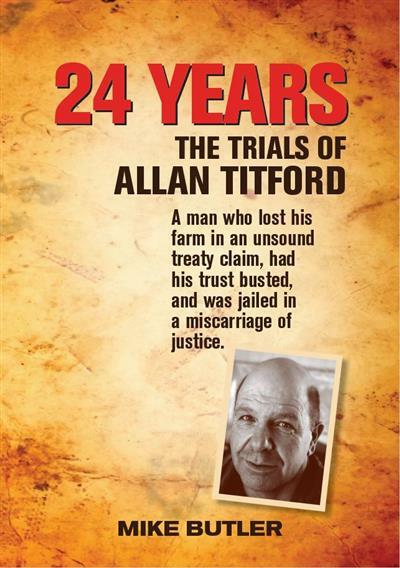 TRIALS OF ALLAN TITFORD In 1987 Allan Titford was being driven off his farm by people who claimed that part of it was Maori land. His story captured the hearts and minds of many New Zealanders. However in 2013, when he was jailed for more than 24 years, he was called "a slave driver, a monster and a liar". This book tells how a treaty claim took private land against the will of its owners despite evidence that the claim was unjustified. 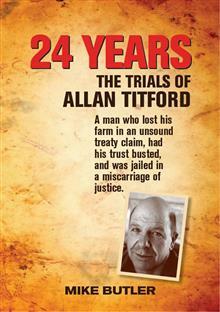 It analyses how Allan Titford was jailed for such a long time. The record jail term is bizarre considering that 12 charges relied on the uncorroborated testimony of a person who admitted to perjury. Moreover, many of the 53 charges against him were hardly tested in court. It also shows a hidden parallel story about how the justice system was played for financial gain. This book exposes judicial failure in both the district court and the Court of Appeal. It asks whether the process used against Allan Titford is standard practice in the New Zealand justice system and how many more victims have been locked up by using these methods. Author Mike Butler graduated with a B.A. in English Literature from Victoria University. He worked as a journalist and sub-editor for the Hawkes Bay Herald-Tribune in Hastings for eighteen years, then as a contract writer for the New World Encyclopaedia. He has published numerous articles in newspapers and magazines and wrote The First Colonist - Samuel Deighton, 1821-1900, the story of his great-grandfather. He was a member of the Independent Constitutional Review Panel.